The computer has a resolution of 51 pixels/characters horizontally by 19 pixels/characters vertically. The direction the computer is facing. Power state of the computer. computerID Id of the computer. on Power state of the computer. Terminal size can be changed in config. Added ctrl + r shortcut for reboot. Added ctrl + t shortcut for terminate. Added ctrl + s shortcut for shutdown. No longer get destroyed by water. Can be labelled, destroyed and moved around, keeping their state. Can connect to adjacent devices and turn them on or off. 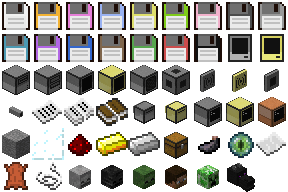 Labelled Computers can now be crafted into Turtles or other Turtle types without losing their ID, label and data. The default size of the Computer screen has been increased. They no longer crash when used with RedPower frames. Fixed labelled Computers not keeping their data when destroyed. Added ability to change the background and text colour (black and white only). They can now control Command Blocks, if enabled in the config. They no longer drop in creative mode, until it is labeled. Can be labelled using Name Tags and Anvils. Added support for grey and lightGrey. Can be mounted in Disk Drives. The interface of the computer. This page was last edited on 7 April 2019, at 04:20.